As expected, Apple Tuesday morning announced it would be holding a press event on Sept. 12. 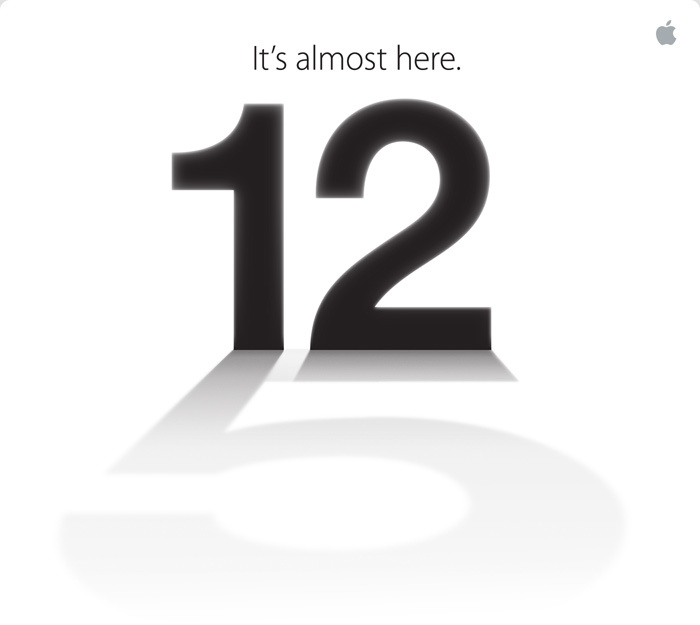 Based on the image in the invitation sent to us, a 12 with a “5” in its shadow, Apple’s being pretty clear what the topic will be: iPhone 5. The event will be held, as is customary for many Apple events, at the Yerba Buena Center for the Arts at 10 a.m. GigaOM will be there and covering the event live as it unfolds. It has been rumored since late July that the event introducing a new iPhone would happen in September, a little earlier than the iPhone 4S, which debuted in early October last year. Apple blog iMore was the first to publish the Sept. 12 date. What’s not clear is if the rumored iPad mini will also make an appearance at this event next week. Several reports have pegged Apple holding a separate event for that product, possibly in October. Its 12.9,so where is 5 ?? Had it’s Birthday back in June. The new iPhone, the iPad mini and the refresh of the 2 iPods. I think Apple will stay consistent with the naming convention it uses for the iPad. They could have called it iPad 3, but no. The same goes with iPhone. My bet is this will be one event to rule them all. Apple will launch FIVE new products. iPhone, iPad Mini, iPod Touch, iPod Nano and new iMacs. I am hoping the 5 products guess would be the right one! They take forever to upgrade some products while their competition is putting out too many products in all color variants. then why would they put the number 5 on their invitation? ?